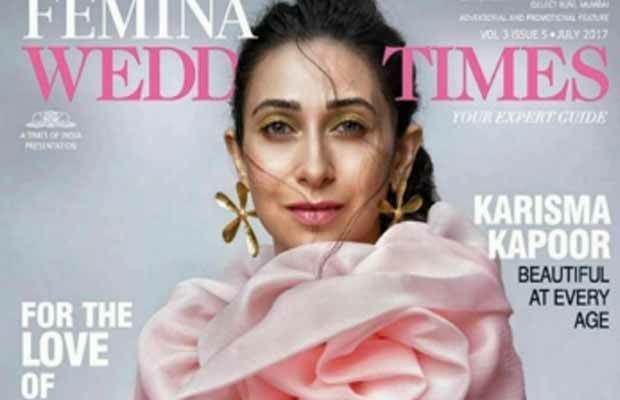 Karisma Kapoor graces the coverpage of Femina Wedding Times with this dazzling look! The Bollywood actress Karisma Kapoor, although away from films for quite a while now, is still very much a part of the industry. The actress has been holidaying in Europe and we had shown you all some of her lovely pictures from her vacation. Now another look of Karisma has been revealed, but this time it’s not from her trip. It is rather the actress posing for the coverpage of ‘Femina Wedding Times’. The 43 years old actress can be seen dazzling in a baby pink dress with a messy hair, which adds to her grace. We just love her flower shaped golden earrings and that golden eye make-up is going perfectly with her look. She has also worn some funky jewellery pieces in her fingers. “The Beauty Blowout” is what the Magazine cover title reads and we think that Karisma’s look is just the right one going with it! The actress seems to be enjoying her single status. She was married to a Delhi-based businessman, Sanjay Kapur. But they are separated now. Karisma is a mother of two kids, Sameira, her daughter and Kiaan, her son. While Sanjay has completely moved on after breaking his ties with Karisma, the actress has also found a new love in another man. According to the reports, she has also been dating a Mumbai-based businessman, Sandeep Toshniwal. Although, neither have come up accepting their relationship. On the work front, the actress might be making a special appearance with Salman Khan in Varun Dhawan’s ‘Judwaa 2’. Previous articleThis Famous Celeb Couple Is Now Proud Parents To Twins Through Surrogacy! Next articleDid Bharti Singh Have A Heated Argument With Kapil Sharma On First Day Of Shoot? Bharti Reacts!